Specialty by CSSIgniter a responsive premium Job Board theme for WordPress. 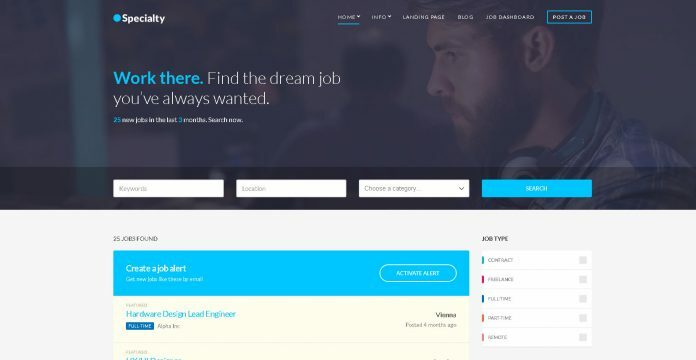 Powered by WP Job Manager, Specialty offers full design integration of the plugin. Specialty is carefully crafted around WP Job Manager, the official plugin from the makers of WordPress. Add, manage, and categorize job listings using the familiar WordPress UI. The ideal choice for those who wish to build a versatile, WordPress-powered and professional job board website. A wide range of customizer settings are waiting for you to play with. Upload your own logo, configure every kind of color or manage the typography. Make your new website truly unique and up to your taste. Use your favorite WordPress Page Builders like Elementor, The Divi Builder or SiteOrigin Page Builder for stunning Landing pages!